No review is complete without a look at drive performance! We took a closer look at data transfer speeds on USB 2.0 port, microSD slot and the internal Samsung MGB4GC 32GB eMMC storage drive. This eMMC solution won’t be capable of mind-blowing speeds, but it should give fairly respectable performance for a tony soldered down NAND Flash solution. Samsung MGB4GC eMMC has also been used in other devices like the HP Stream 7 Windows Tablet, so it is not unique to this particular PC. 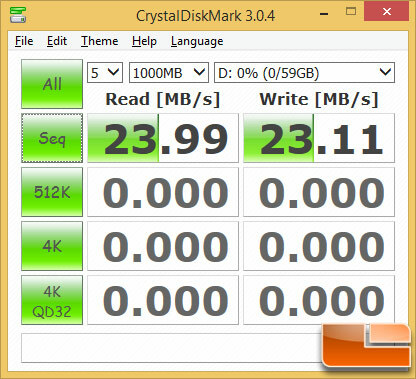 A quick run of CrystalDiskMark v3.0.4 showed the sequential read speed at 168 MB/s and the write speed at 78 MB/s! The Random 4K read speed was 16.6 MB/s and the 4K random write speed was 12.9 MB/s. 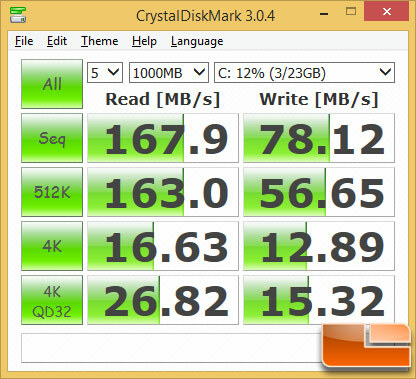 Taking a look at another storage benchmark called ATTO, we find that the SSD reaching speeds of up to 176.2 MB/s read and 79.7 MB/s write. 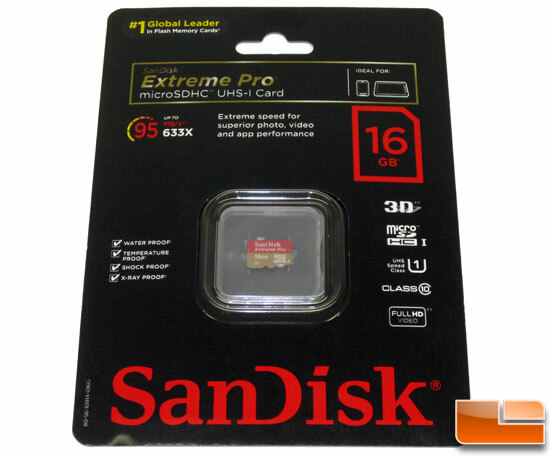 To try out the side microSD slot we used a SanDisk Extreme Pro microSDHC UHS-I 16GB memory card that is capable of 95MB/s read speeds and roughly 85MB/s write speeds. We tested the microSD slot and found that the SanDisk Extreme Pro microSDHC UHS-I 16GB memory card topped out at just under 24 MB/s on the read and write speeds. 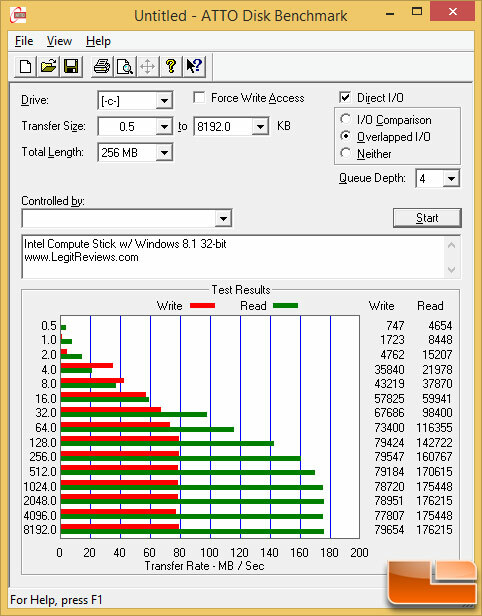 The microSD slot on the Intel Compute Stick worked with out UHS-I cards, but obviously disn’t capable of supporting UHS-I speeds where we have topped 80 MB/s on both reads and writes on this exact microSD card. 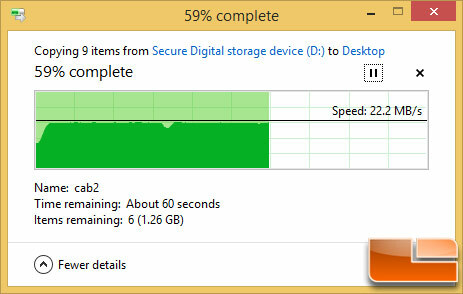 Real world file transfers from a microSD card to the Windows 8.1 32-bit desktop shows that we were getting between 20-22 MB/s when moving a file from the microSD card to the eMMC storage drive. 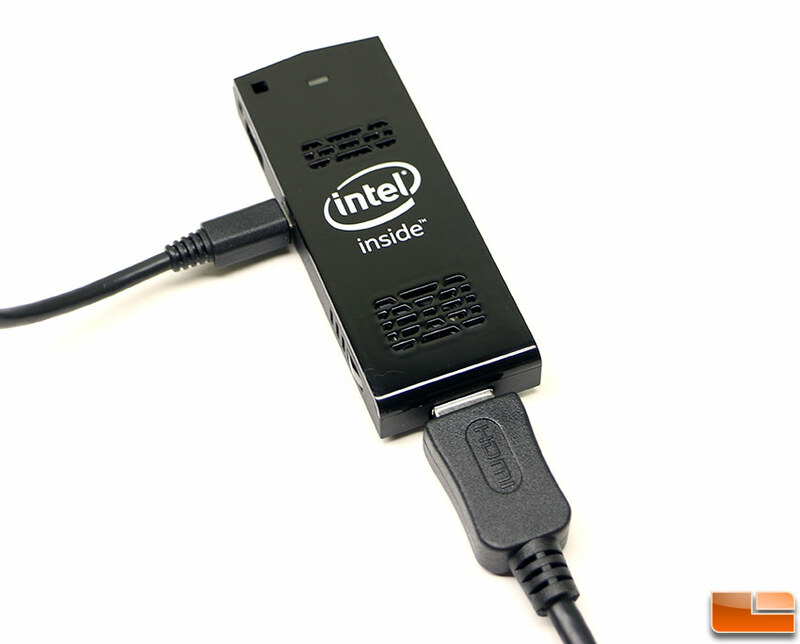 Let’s move on and take a look at the wireless performance of the Intel Compute Stick!